An outdated home office can be a dull part of your otherwise aesthetically pleasing, welcoming home. Finding a balance between attractive and functional, as well as favorable to being productive, can be challenging. However, our team of home office remodeling contractors at Republic West Remodeling can help. In fact, we can help you design and renovate the perfect workspace for your home. As part of the home office renovation process, we work with you to collaboratively create a home office customized for the way you work best. Some homeowners tell us the reason they do not have a home office is that they lack the space. But did you know that much of the floor space in many rooms of your house is unnecessary? As such, do not be afraid to repurpose a rarely used room to take advantage of the valuable space in your home. For example, you may consider sectioning off a corner of your dining area or family room and turn it into a great work space. In fact, there are plenty of innovative, creative ways to fit work areas into smaller spaces, including fold-out, wall-mounted desks, or workstations concealed within a closet. A home office renovation involves more than just placing a desk into an empty room. Choose colors and design elements that are pleasing and which will help you be more productive in the space. If you work primarily in your home office, you will be spending a lot of time in your chair. Be sure it is comfortable, the right height, and functional. Keep any clutter to a minimum so you can maximize productivity. You should always neatly store files and documents away. Supplies should have a storage location, and your desk should be clear before you sit down to work each day. 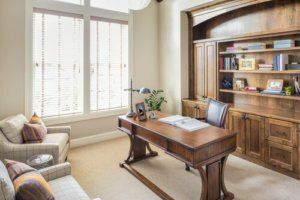 The scope of your home office renovation project will depend on the design you have in mind, and the features you need. While everyone’s vision for a home office is different, you will usually need a desk or other workspace, storage areas, and connections for electronic equipment and computers. Republic West Remodeling is committed to providing an exceptional experience to you throughout the entire home office renovation process, from creative design to detailed planning, execution, and construction. We reach this goal by adhering to a strict set of guidelines that serve as the foundation of our process. Contact us today for your home office renovation. We proudly serve Scottsdale, Phoenix, and the Phoenix metro area. Call (480) 428-2695 for your free consultation or contact us online.